Hands up those of you who have seen The Frank Spencer Trio perform, If you haven’t been to a Smycms After Show Party then you won’t have had the pleasure. 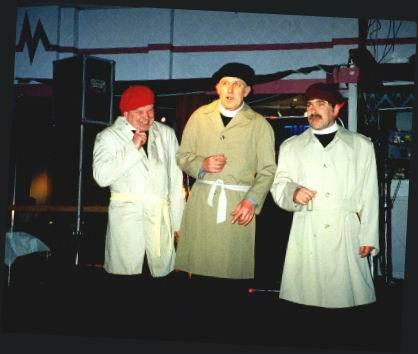 Here is a brief reminder, the year was 2000 and SMYCMS were performing the musical Anything Goes by Cole Porter, as tradition dictates, the majority of cast and crew, after the show each night would make their way to a suitable drinking establishment namely the Nova Hotel at Bruntsfield. It was there on a dark and stormy night that the fiendish, nay, cunning plan to perform a musical interlude at the After Show Party for the amusement of the company, first reared its ugly head. The three plotters, namely Graham, Alan and Tony, would sit giggling in the corner with their cider and babycham for company, and they would produce an idea that was so simple yet would be awesome in its reveal.THE IDEAThe Song picked was an obvious choice, “Be Like A Bluebird” which as you recall was sung in the show by Kevin who was playing the character of Moonface Martin, a small time crook. It was also picked because it was easy to learn. Next came the costume, which again picked itself, Moonface Martin as one of his disguises dressed up as a Minister, this combined with the Beret and Raincoat of one Frank Spencer, what’s that you say “Why Frank Spencer?”, Well, anyone who knows Kevin will say what a great guy he is and a fine character actor too boot, unfortunately the character he keeps thinking of is Frank Spencer. You wouldn’t believe the hours the three of us stood in front of the mirror going, “nnnnngggghhhh” and smiling out the corner of mouths aka Frank. 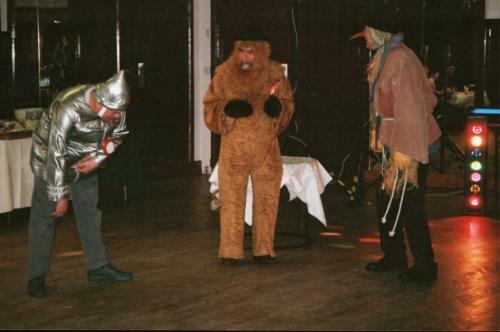 Perfection doesn’t come easy, anyway I digress from my tale, we now had a song and a costume, al we would have to do next would be to choreograph a routine but wait Graham wasn’t finished with the costume for he had something up his sleeve, sorry I should say up his trouser leg. This small attention to detail would ultimately provide the BIG END that we needed to maximise the punchline, but it also nearly consigned our ideas to the waste paper bin as we started to get cold feet. In this enlightened age the sight of two blokes going into a toilet together wouldn’t raise an eyebrow now would it, But back in 2000 these things were never seen, at least not in the places I visited, and so it was that the only place for some privacy was the toilet on the corridor leading from the dressing rooms up to the stage area. Graham and Tony snuck in quietly and in secret to the toilet. obviously they wanted no one to see them and ask what they were up to also they didn’t want folk to think there were doubts about their sexuality, Oh how folk talk, ” Here did you see that Graham and Tony going into the toilet together, didn’t I tell you there was something going on between them, have you seen them in the pub after the show they always sit whispering and giggling in a corner, I tell you there’s something brewing and its not Tea.” It was Saturday between shows, the matinee had finished and they had had something to eat, it was time to put the finishing touches to the costumes. 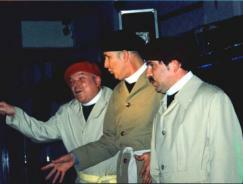 It was Graham who had come up with the idea, though he had wanted to drop their trousers fully but Tony and Alan had knocked back that idea so they all settled for a compromise and so there stood Tony, in front, bent forward as Graham set to work with his scissors to cut two large holes in Tonys trousers. Tony could feel the hot breath lingering on his now exposed cheeks something was stirring……(ED. can we just get back to the story please.) I’m Sorry I was getting carried away there, anyways Graham says to Tony ” Right come on get your other trousers on and we’ll get back to the dressing room we don’t want to arouse suspicions.” Tony looked at him, mystified ” What do you mean OTHER TROUSERS! !” Graham started to laugh, ” You mean you’ve not brought a change, how are you going to get back without being seen. What a DIV.” Slowly it dawned on Tony, what a Tube he thought to himself, soon they were both laughing, Graham at Tony! Quickly they hot footed it back to the dressing room, Tony first with Graham following closely, bringing up the rear (ED. A sort of rear guard action.) Everything was slipping in to place (ED. I thought you said there was nothing going on!!!.) What I mean is they now had a song, costumes and a routine all that was left was to Rehearse, Rehearse, Rehearse and they would be all set for a live performance. Alan was wondering what he had let himself in for, as he gingerly pulled on his newly adapted trousers. You remember Alan don’t you, the third member of The Frank Spencer Trio. Level headed, talented, sophisticated and good looking too boot. Alans job was to keep the other two in check, giving them just enough rope to be creative but little enough so as to quickly rein them in should their creativity get the better of them, ” C’mon guys” he would moan, eyes rolling skywards, “Stick to the script”, then he would remind them that preparation is the key to success, plenty of rehearsal and attention to detail would mean a performance that would be slick and professional. Alan always liked to be prepared, while the other two would quite happily wing it by the seat of their pants, though on this occasion they would have two large holes cut in the seat of their pants. Oh I’m terribly sorry, have I not said, I do beg your pardon. Let me just consult the dictionary, ” To Moon, to wander about and gaze vacantly at anything. Hold on it’s the line below and I quote, ” Moon, To drop ones trousers and Y-Fronts while bending forwards thus revealing your moon cheeks”, only this time our intrepid trio would not be dropping their trousers, they would merely be bending over thus revealing the punchline…..?. Hence the holes in the trousers. Six holes, Six lily white cheeks, Six letters…M..O..O..N..I..E… Who managed to keep a straight face?, How did she manage to keep a steady hand, Who thought it tickled?, and why did Boots No.7 Lipstick have such a lasting effect for one of the Trio?. Find out these and other answers as we reveal the lady who was asked to write the word MOONIE across six cheeks using Ruby Red Lipstick?. Can you imagine the scene, (ED. haven’t you just told everyone?) as Graham attempted to raise the subject of the entertainment at the After Show Party, and the need to borrow some lipstick, (ED. For legal reasons we can not reveal the identity of the person who was to ultimately brandish said lipstick like hot iron across those lily white cheeks as if she were branding cattle, in Grahams case it was more like, “this is not just any cattle, this is Aberdeen Angus cattle at the Ponderosa Ranch, YEEE HAAAR”.) For the purpose of our tale let her be known as Ann, though she did look remarkably like Grahams good lady, Graham assured us that he had met her down at the docks, I think he said she had a business down on Salamander Street. Come to think of it there used to be a Demolition Company there, and he did say she was good at blowing things up, for a small fee. Ann was surprisingly shake free, considering she was laughing, as she carefully wrote M…O…., that was Graham covered, then O…N…, and that was Alan sorted, finally I…E… and Tony felt relieved. It was just as well Ann could spell because we would have looked complete divs if we had turned round and revealed O N I E M O, Thank you Ann for you help, but there is just one thing that has puzzled me for all these years, did you just put the lipstick back into your make-up bag or has it been sold on EBAY….(ED. of course she didn’t put it back you div, after she’d written MOONIE across your three fat arses there would be nothing left, I ask you!!). Join us next time when we reveal the Crit by Tom Dustbin, that was never published, of the performance by the Frank Spencer Trio. This is Frank Exposure reporting from the Gents Toilet at Marco’s Leisure Centre, saying Goodbye.